Samsung on Wednesday announced its latest tablet, the Galaxy Tab S4, and this time around the company is pushing the tablet's productivity and multitasking prowess in an attempt to woo customers before Apple's expected iPad Pro revamp sees release. "Tablet mobility, PC power" is the line Samsung is pushing, highlighting the ability to use Samsung DeX on a tablet for the first time. 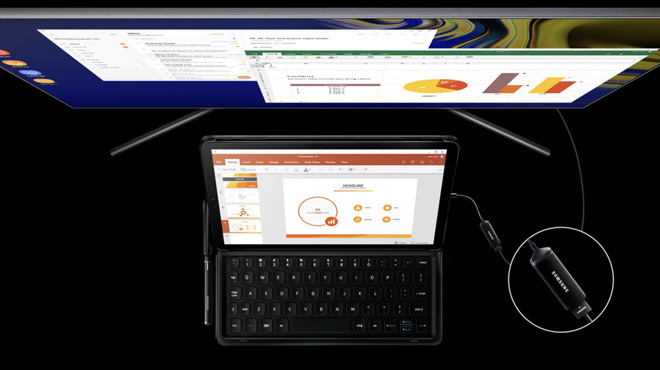 Samsung DeX originally launched on smartphones, allowing a device to be docked and used with a monitor, keyboard, and mouse. On the Tab S4, no dock is necessary, just an HDMI adapter. Any Android-capable keyboard and mouse can be used after launching the DeX app which brings a more desktop-focused interface. DeX allows up to 20 windows to be open simultaneously, while each can be resized and moved around the display. Tab S4 has a 10.5-inch Super AMOLED display in a 16:10 aspect ratio, with slim bezels and no home button. Iris and face scanning are used to supplement the usual passcode authentication, but we will have to put these to the test to see how well they perform. The tablet runs Android 8.1 Oreo, uses the last generation Snapdragon 835 processor, and includes 4GB of RAM. There are dual 13-MP cameras on the front and rear, a USB-C port, a microSD slot, a keyboard connector (similar to Apple's Smart Connector), and of course the headphone jack is sticking around. Included in the box is Samsung's S Pen, a pressure-sensing stylus similar to the Apple Pencil. To go alongside the Tab S4, Samsung is making an optional keyboard accessory available for $150 which could be useful for integration with the DeX interface. Speaking of, whenever Tab S4 is docked into the keyboard, DeX is automatically launched. 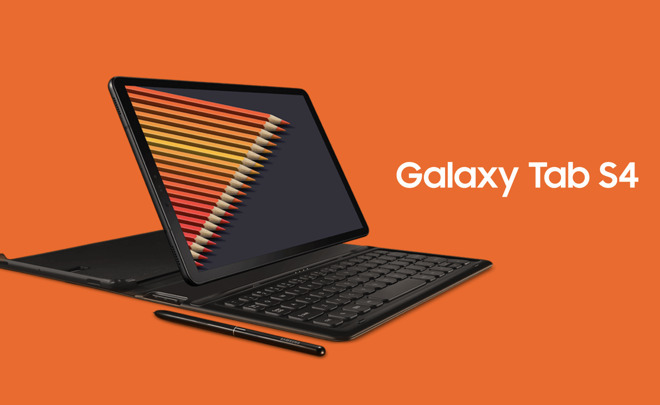 Samsung began to take preorders for the Galaxy Tab S4 starting today with shipments starting August 10th. For those in the market for an LTE model, Verizon, Sprint and US Cellular will have them available. All in white or black. The basic 64GB version will run $650 and the 256GB version will run $750. These new tablets are squarely aimed at Apple's iPad Pro line, which is due for a refresh. Apple is expected to launch new iPad Pros later this fall, with the most recent rumors say will be smaller and lose the headphone jack.